Professional Military Education (PME) covers a wide range of activities. In one sense it refers to a plethora of training, continuing education, and other activities designed to provide development to members of the military at various points in their career and to prepare them for the next level of responsibilities. The U.S. military requires professional education for both officers and enlisted personnel and its form, content, and objective varies across rank, service, and military role. But what is its overarching purpose? Why do we invest so much in this effort? 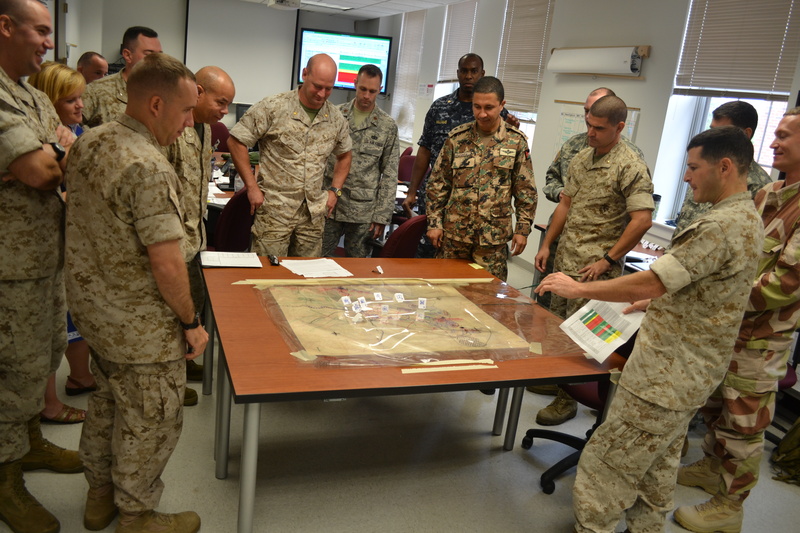 In his 2012 White Paper on Joint Education, General Martin Dempsey argues the purpose of PME is “…to develop leaders by conveying a broad body of professional knowledge and developing the habits of mind central to the profession.” In addition to critical thinking, he lists the ability to understand the security environment, respond to uncertainty, anticipate and lead transitions through change, and operate with trust, understanding, and empathy as important skills for future military leaders. Chairman of the Joint Chiefs GEN Martin E. Dempsey speaks at the graduation of a class of National Defense University, 2015. Taking this document as a starting point, I focus here on the Staff and War College experiences in U.S. professional military education. While many of the questions raised here apply equally—if perhaps differently—to the education of others in the military and other militaries, a narrow scope allows for more precise framing of questions about the purpose of PME. While it seems we would be able to discern the purpose and aims of military education by looking at various official military and institutional documents, they only tell part of the story. What we find upon closer scrutiny are multiple stories about what exactly professional military education is supposed to do and how it is to be done. Some think of it as the equivalent of graduate school needing research and rigor, others think of it as training that ought to be conducted by expert practitioners, and still others a higher level initiation into the Profession of Arms. Accordingly, a closer look at PME is necessary to clarify these basic questions, which then can lead us to thinking through what the focus and content of these experiences ought to be. Even cursory discussion with military professionals about their educational programs generates a wide variety of responses. Some have good growth experiences and appreciate the sabbatical nature and the break from deployments or other duties (especially of the War College experience) with time to study new material, build new skills, and interact with knowledgeable faculty as well as international and domestic colleagues in military and civilian circles. Others report less positive experiences, seeing the experience as lacking rigor and enrichment, failing to prepare members for the next stage of their career, and/or frustrating in terms of the abilities (or lack thereof) in fellow students and/or faculty—sometimes to the extent of questioning whether the experience was a waste of time and the tax-payer’s dollars. From a more formal perspective, academics and other commentators have raised concerns with various aspects of professional military education that echo some of the more informal reflections above. Journalist Tom Ricks is well known as a long-standing critic of the education provided at the academies and war colleges, questioning their rigor and the degree to which they are really valuable educational experiences. U.S. Naval War College faculty member Dr. Joan Johnson-Freese has also written extensively on this issue, calling for better assessment, questioning the rigor of these military programs (especially in relation to counterpart civilian institutions), highlighting issues such as tenure and the ability to criticize the individual institutions and professional military education more generally. There are others who both critique and work from the inside to improve professional military education, as evidenced by efforts like the U.S. Army War College’s reassessment of academic governance in 2012. Given the focus on metrics and assessment, it is safe to assume similar internal conversations are on-going in other related institutions and groups, thinking about how to ensure professional military education achieves its objectives. Before we can wade into and make sense of the arguments and issues raised in the critiques above, we have to ask a number of questions. What exactly is the purpose of professional military education? What should students who have been through such an education be able to do? What should they think and believe? What becomes clear is the myriad of answers to these questions. We have already noted the idea of a break/sabbatical from military duty to reflect and study, but what should be studied? At the War College level, the curriculum focuses on strategy, critical thinking, writing and communication, diversity, and various skill sets and content on the U.S. government that officers will need as they move from leading at the tactical to the strategic level. At this level, incoming students are presumed to have mastered tactics, but now have to move into another realm with distinct realms of engagement with civilians and other constituencies. The concept and execution of joint work with these constituencies, as well as other military colleagues across different forces and international contexts, is also a significant emphasis at this level. One prevailing view is that professional military education at this level is analogous to a civilian post-graduate degree designed to put an individual at the same level as those with whom they will work, both in terms of credentials and a basis of knowledge and expertise that will be a consistent product across institutions and cohorts. The idea is that these officers need a common basis of knowledge with each other and with others in the national security community in order to operate effectively at the next level of leadership. Another view sees professional military education as further development in the Profession of Arms, socialization and development of expertise, as well as networking and developing a sense of community and belonging at a higher, more elite level. The heavy focus on strategic leadership in the military context which is part of these curricula seems to support this skill set as critical. In this view, professional military education is, at each nor level of responsibility and influence, an initiation into a professional community of practice. Each of these perspectives, considered in isolation, will lead to a particular design for the professional military education curriculum, and those curricula would likely differ in their requirements for content and rigor. If no single perspective is dominant, though, and each is afforded a substantial place in the design of a curriculum, the result is a long and ambitious list for less than one year of study! This raises some important questions, though. Are all of these elements really the aim of education in the military? Are they of equal importance? What are the central aims and what elements are desirable, but not essential to the PME experience? At least in the case of the war colleges (and one suspects an analogous conclusion holds for professional military education at other levels) there is a roughly consistent curriculum with a particular content emphasis and cohorts made up of U.S. and international officers, including a wide range of educational backgrounds and abilities, which is challenging as different people are starting in different places and with different skill sets. This raises the question of quality and how students are to be assessed as they go through these programs. Is it important that students perform at a certain level? Or is it more important that students have the experience, even if different students perform at different levels of proficiency? The question of quality and assessment brings up the question of whether we are to view professional military education (especially at the senior levels) primarily as training, as education, or as some combination of the two. Training, by definition, is more oriented towards skills and seems a matter of completion, while education is much broader (although it can include skills) and rigor and quality assessment seems more appropriate. If professional military education is connected to promotion/advancement, that adds another level of complexity, and performance in school might be relevant. Despite moves by the War colleges to incorporate more research projects allowing for a development of deep expertise on the part of the students (having a thesis project, professional presentation, and publication),the context, timeline, and incentives in professional military education are different from many civilian graduate schools, where there is an expectation of narrow, deep expertise in a particular area. Again, we can ask a number of questions. What is the point of research as a part of this experience? Is it to provide development of expertise and experiences? Is it to provide equality of credentials? And why should we expect or desire equality of credentials for military leaders? Two Paths….or a Third Way? In my view, there is either 1) a tension between the different ways professional military education is thought of (as discussed above) and what the curriculum does in effect/practice; or 2) it is time to rethink PME, especially in terms of academic rigor. Academic rigor would seem to require less pro forma instruction/curriculum and more freedom, flexibility, and challenge to match what graduates will find in their future positions out there, including risk taking, innovation, disciplined disobedience, and mission command. We could also consider that the reason for some of the confusion is that there are multiple aims for different kinds of students. On one hand there are calls for more academic rigor and moves to make the senior professional military education experience more like civilian graduate schools. On the other hand, the needs of the military suggest that rather than rigor, students in professional military education need wider expertise and flexibility across a range of areas, with an ability to move between both and be competent and lead in different areas. This is why the original question is so critical. What is the aim of professional military education? How does that match the expectations of the students? What do they think this experience is? How do these student expectations match the expectations of the faculty and administrators at these institutions? How do these match the expectations of the senior military and civilian leaders in the military institution and the policy guidance of Congress? What do senior leaders in the military think is required and how well do they think these institutions are doing? A service member asks a question after Deputy Defense Secretary Gordon R. England addressed the students of the Air War College at Maxwell Air Force Base, AL, Nov. 1, 2007. From these questions, at least two paths emerge. First, we could look at professional military education, even at the senior level, as primarily about building and developing skill sets required for next level of leadership, taught by those who know what is needed. This is primarily training. The goals are to facilitate networking, enable graduates to operate in a joint environment (as it is understood when students attend the War College), and provide them credentials for entry into the community of practice as it exists now, where they will then serve as stewards for its preservation more or less as it is. If this is the intent, then the concern seems to be more oriented around finding appropriate assessment metrics to measure success and deciding how the faculty should be involved in this process. If, however, the desire is less training and more a matter of inculcation of habits of mind (like intellectual agility and related skills) that will enable graduates to anticipate and adapt to emerging changes, then that is a very different track. For these students will need more mentoring and challenging from those who are not a part of the community of practice, (but are familiar with it) so they can think outside of the military community, outside of the Profession of Arms. Recent discussions around concepts like disciplined disobedience, innovation, authentic leadership (not just strategic), and mission command seem to move in a different area altogether and require different approaches, curricula, faculty and modes of assessment. A final possibility is that both tracks are desirable for different students and different contexts. It is possible, of course, the answer is not binary and both kinds of experiences and students are needed for different types of leadership and roles in the military. Perhaps the military needs both innovators and those capable of effectively navigating the way things are now. Perhaps the military needs military personnel to develop both narrow and deep expertise in relevant and emerging areas of interest and generalized capabilities applicable to different constituencies and contexts. If this is a reasonable suggestion, then it will be helpful to clarify what aspects of these educational experiences are education in a strict sense, which are more oriented towards training, and which are a combination. Then, discussions can proceed about quality, the kinds of curriculum and faculty that should be involved and appropriate metrics for assessment. Pauline Shanks Kaurin is a Featured Contributor on The Bridge. She holds a PhD in Philosophy from Temple University, Philadelphia and is a specialist in military ethics, just war theory, philosophy of law and applied ethics. She is Associate Professor and Chair of Philosophy at Pacific Lutheran University in Tacoma, WA and teaches courses in military ethics, warfare, business ethics, social and political philosophy and history of philosophy. Recent publications include: "When Less is not More: Expanding the Combatant/Non-Combatant Distinction," "With Fear and Trembling: A Qualified Defense of Non-Lethal Weapons," and Achilles Goes Asymmetrical: The Warrior, Military Ethics and Contemporary Warfare. Header image: Students and faculty of the U.S. Naval War College look on as Defense Secretary Chuck Hagel answers questions from Jim Sciutto, CNN's chief national security correspondent, during a live moderated session at the Naval War College in Newport, R.I., Sept. 3, 2014. See also https://www.law.cornell.edu/uscode/text/10/2155/ for the legal requirements and parameters for Professional Military Education. See http://www.fpri.org/article/2013/10/rethinking-professional-military-education/ and http://ndupress.ndu.edu/JFQ/Joint-Force-Quarterly-84/Article/1038821/meaningful-metrics-for-professional-military-education/ for two examples. See http://www.dtic.mil/doctrine/education/officer_JPME/cjcsi1800_01e.pdf and note 2 above. He connects ‘disciplined disobedience’ with Mission Command.